That’s a bold claim under any circumstances but maybe not as far fetched as some may think. Linda Smith, a professor at the Indiana University department of Psychological and Brain Sciences has found strong evidence of links between posture and intelligence. She worked closely with Anthony Morse, a senior researcher from the Centre for Robotics and Neural Systems at the University of Plymouth, England. With the aid of some cutting edge robotic modelling, Smith’s team conducted a series of experiments, using robots programmed to learn the name of objects as they changed posture. The same experiments were then run with young children. The team’s experiments tested whether changing position, or posture, of the robots had an effect on how well they remembered things. 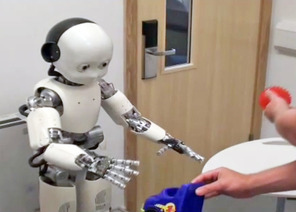 Surprisingly, both robots and the real children showed consistent differences in how well they could remember based on their posture when trying to learn something. Smith’s research focus has been counter to the traditional beliefs that body posture and cognitive processes are separate. While acknowledging that there is a lot more work to do, she believes that the results shown strongly challenge the traditional model. It makes logical sense to us that a healthy posture is linked to intelligence through the improved functioning of body systems – better circulation, more efficient breathing to name two. This new research takes that thinking a step further and will be very interesting to those involved in cutting edge posture correction technologies such as the Lumo Lift and the soon to launch Prana.